A must-do is to walk to the upper plunge pools Great for a swim, without the danger of crocodiles. Maguk waterfall is at the base of a steep gorge. It is not recommended to swim in the lower pool because of crocodiles. On a boat trip to Yellow Water at sunrise you can not only see crocodiles, but also birds. Viewpoint at Ubirr, accessible via 1km long walk along Aboriginal Rock Art. Especially beautiful at sunset. Take a 1.5km walk along Aboriginal Rock Art to this lookout at Nourlangie. Among other things to find at Nourlangie via a 1.5km long tour. There is also a ranger who talks about the story behind the Aboriginal Rock Art. The route to Jim Jim Falls and Twin Falls are only accessible via a 4WD car. Tip: Download the map to your smartphone and save it as image so you can use it offline. Splash around in crocodile-proof plunge pools with spectacular views under or over waterfalls. Go on a crocodile boat tour and see rare birds. Take a Kakadu crocodile boat tour at sunrise (during this time, the lighting conditions are ideal for taking photos). Explore Nourlangi's Aboriginal Rock Art (with informative ranger talks) and a great view. Discover the two waterfalls, Jim Jim Falls Kakadu and Twin Falls (with a boat tour of the gorge). Watch out for the crocodiles when the river flow direction changes at Cahill's Crossing (at low and high tide, the direction of the East Alligator River changes and the crocodiles wait with open mouths for fish). Enjoy the best views of the park and the river floodplains at Nadab Lookout near Ubirr Rock ( it is most beautiful at sunset). Kakadu National Park is a protected territory in the Northern part of Australia. The exact Kakadu National Park location is actually 171 km southeast of Darwin. This park covers nearly 20,000 square km and is a paradise of great biological and ecological diversity. What makes Kakadu unique is its aboriginal Rock Art that originates from more than 65,000 years ago. The aborigines are the oldest living people on earth with the most ancient culture. This national park is a World Heritage site due to its breathtaking cultural and natural values. The floodplains demonstrate the effects of sea-level changes that occur in northern Australia and the Kakadu wetlands with their sweeping landscapes are considered to be internationally important. To explore this national park, energetic visitors can take part in Kakadu 4WD safaris for the ultimate adventure tours. The Aborigines have occupied this area for at least 50,000 years. The name Kakadu is an interpretation of the Aboriginal language, Gagudju. You can find over 10,000 insect species, 200 bird species, and more than 1500 different plants in Kakadu. Some of the Kakadu National Park animals are extremely rare, vulnerable, or endangered. They are not found anywhere else in the world! From Kathrine, it is 150km to the Mary River Roadhouse (58km from Pine Creek), where there is a tourist information office. Here you can buy tickets for the Kakadu National Park (alternatively you can buy them in Katherine). For those who already went on a different route, they should get petrol here and stock up with food supplies if necessary. The Mary River Roadhouse is another 48km to the famous Gunlom Falls. The highlight in Gunlom Falls is the large wading pool below the waterfall. Here, however, most tourists tend to stop going further, but those who want to escape the crowds can walk via a steep 10-15 minute trail to the actual waterfall. In the upper plunge pool you can enjoy a magnificent view and you get to have a little more privacy. From Gunlom Falls we recommend that you drive towards Maguk and spend the night at the campground. It's a nice Kakadu National Park camping ground with a separate fire pit for every spot, but there is no firewood on the campground. Our tip: there is enough wood on the way to the campground so just take some along the way. If you have a little more time, you can always take 2 days for today's route, otherwise it will be a tight schedule and you should definitely get up early. We start the day with a short hike to Maguk Waterfall. In about 15- 20 minutes, the lower plunge pool can be reached. Here you can cool off a little and swim under the waterfall. Even better are the upper plunge pools, which can be reached in about 15 minutes. The entry point is a bit difficult to find. The best way is to follow the river until at some point a sign appears, which leads you to the other side of the river. If you follow this sign, you will reach the lower basin. If you stay on the left side of the river, you will reach the upper plunge pool. The upper pools are a must-visit and if you start early enough you can be sure to have the pools almost to yourself. There are several pools that merge into one another until the last pool that flows into the waterfall. The latest time you should leave the parking lot is between 10 and 11am. If you are travelling with a 4WD vehicle, you can visit the two waterfalls Jim Jim and Twin Falls in about 2 hours. This part will take up a lot of time so it is better to take an extra day, otherwise you won't be able to see everything. If you visit the Jim Jim Falls in the dry season, the waterfall will unfortunately be dried up. Nevertheless, you can reach it via a 2km long circular walk (about 1-2 hours) next to a deep paddling pool (not suitable for swimming due to crocodiles), which is surrounded by 150-metre-high cliffs. Another worthwhile route is the 10km drive to the Twin Falls. As you will need to cross the river, there is "snorkel" equipment in your 4WD car. Once the vehicle enters the water, you will need to use the snorkel to inhale air. (The combustion engine needs air in order to work properly). You can book your boat tour ticket at the Bowali Visitor Centre or the Garnamarr Campground. One of your Kakadu tours can include the Twin Falls (takes about 2 hours) to see the gorge. Alternatively, you can also reach the 6km plateau of the Twin Falls on foot and enjoy a great view with various pools. If you only have one day for today's route, you have to choose between the two waterfalls. We recommend booking the boat tour for the Twin Falls. The next stop is Cahills Crossing to see the crocodiles. Cahills Crossing is a popular place for the crocodiles as the flow of the East Alligator River changes at low tide and high tide. The crocodiles then wait with open mouths for the fish that swim there without having to make any effort to catch them. Here is a schedule for low and high tide times. At the end of the day, do not miss the sunset at the Nabab Lookout. It is probably the most beautiful vantage point in the park with a great view over the river meadows and especially beautiful during the sunset. We recommend looking for a place to sleep near Yellow Water as the boat tour starts from there at sunrise. Today you should also get up early and take a Yellow Water boat tour at sunrise. The chance of seeing crocodiles here is 99% plus you get to spot some rare birds. The lighting conditions at sunrise are specially unique and beautiful photos can be taken. The boat tour includes a breakfast afterwards, so it is not necessary to have breakfast before the tour starts. Afterwards you will be taken to Nourlangie where you can look at Aboriginal Rock Art and enjoy a great view. 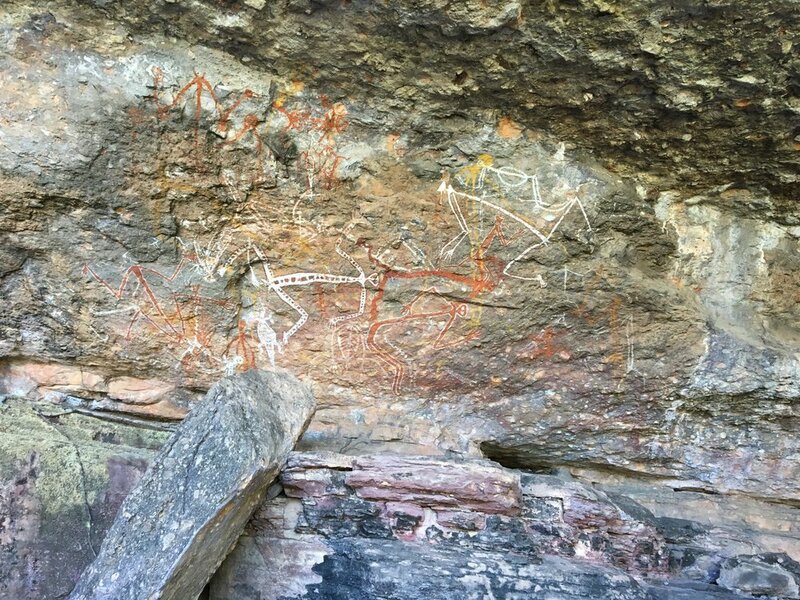 At Nourlangie rock art tour, there are several informative ranger talks about the history of the Aborigines in Kakadu National Park and their Rock Art. If you drink alcohol you must bring your own and drink in the campsite or in Jabiru as the Australian government has banned alcohol in the park. There is never any firewood at the campgrounds so you should preferably collect some on the way. Maguk Waterfall: towards the upper part of the river turn left along the riverbed and then over the mountain. Turn right along the riverbed as you pass the bottom plunge pool. The upper pools are crocodile-safe. Coming from Pine Creek: 6km after the Mary River Roadhouse turn left to "Secret Billabong" with 3 pools. This waterfall with "water hole" is Kakadu's hidden gem hence the reason there are no tourists here. 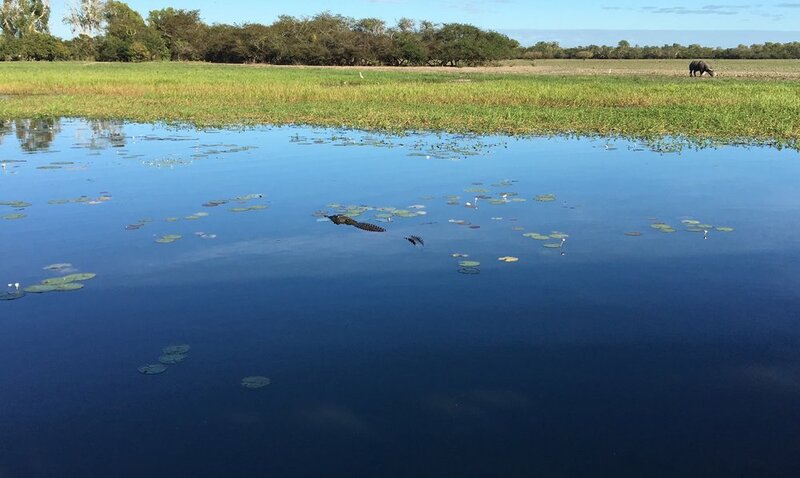 Although live bait fishing isn’t allowed in Kakadu, you can still enjoy recreational fishing by using a single hook in the west waters of Kakadu Highway. Fishing is also permitted in Sandy Billabong, Jim Jim Billabong, and some camping sites. Another related activity is boating, which can only be done with motorised boats. This popular activity is permitted in South and East Alligator River as well as in Jim Jim and Yellow Water. There are over 25 bushwalking hikes to take part in Kakadu National Park. These tours range from half an hour walks to scenic lookouts to overnight hiking. Some trails require rock hopping but most are relatively easy. You can choose from a wealth of breathtaking locations in Twin Falls and East Alligator River, where it will be possible to take a challenging 6 km walk through Kakadu National Park. Scenic flights are the best way to truly experience the unspoilt landscape of Kakadu. You can get a bird’s eye view of the famous floodplains and wetlands by flying over them. Helicopter tours are available in both dry and wet seasons and depart from Darwin and Jabiru. Some of the sights that you will see along the way include the mighty Magela Wetlands and the Mikinj Valley of billabongs. From May to December, you can see many stone country and rainforest bird species in Kakadu. There are also finches and beautiful birds of prey as this national park is home to one third of Australia’s birds. It is in Mamukala Wetlands that you can marvel at the bird species from a bird watching platform. From end of August to end of October, lots of magpie geese fly through the park in their thousands. These birds are traditionally a bush food for the park’s Aborigines. As Kakadu boasts a tropical climate, it is perfectly natural for people to want to go for a swim in the river. But do watch out for crocodiles, especially in Billabongs. You wouldn’t want to see them up close! 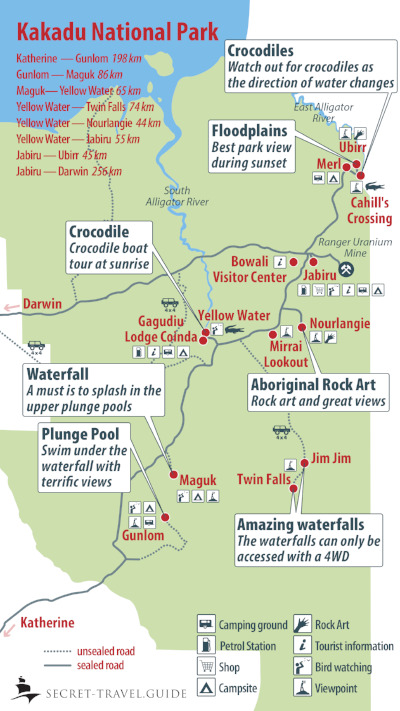 The best and safest places to go for a swim are in Jabiru’s public pools as well as above the waterfalls, where crocodiles are less likely to access them. When is the best time to visit Darwin and Kakadu National Park? Darwin is an ideal destination for a winter visit for a number of reasons. It benefits from a cooler climate from June to end of August. The best time to visit Kakadu is from May to September September as most roads are generally open and the weather is comfortable. What is the distance from Darwin to Kakadu? To the entrance of the park somewhat 210 km. From Darwin to Jabiru 256km (please also see our distances table above). How far is Kakadu National Park from Sydney? How to reach Kakadu National Park? If you are traveling from another country, you will need to fly into one of Australia’s major cities before taking a further flight to Darwin. Alternatively, you can hire a 4WD car and drive to Darwin. The road trip will take around 3 hours and there are many sights to discover along the way. What are the Kakadu accommodation offers? This national park is filled with some great accommodations that are perfect after a day’s trip. There are hotels, cabin rooms, and campsites for your caravan or tent. You can get really close to nature by staying overnight at a campsite. But if you’re after a more comfortable accommodation, Kakadu offers budget-friendly hotels and cabins that will cater to your needs. When is Kakadu National Park open? It is open 24 hours a day but the Kakadu Access Report provides updates on a daily basis about the main visitor sites throughout the park so make sure you check the report before booking your trip. Are there any Kakadu tours from Darwin? Yes, there are a couple of tours that depart from Darwin, such as the day tour by coach and Yellow Water boat cruise. If you have time, why not choose an overnight tour from Darwin that includes a visit to Katherine and its surrounding national parks. Who manages Kakadu National Park? The national park is jointly managed by the Commonwealth Department of Environment and Heritage and the Aboriginal owners. Who lives in Kakadu National Park? Aborigines have been living in this national park for thousands of years. They are the first Australians who still live in this region today. When was Kakadu National Park Heritage listed? Do I need a four wheel drive to visit Kakadu? Some areas in Kakadu can only be accessed by a 4x4. But there are other places, such as rock art sites in Ubirr and Nourlangie that can be reached with a two wheel drive vehicle. However, you are more flexible and have much more fun with a 4x4. Is Kakadu National Park suitable for children? Yes, there are plenty of children-friendly bush walks, painting workshops, and ranger-guided tours for the little ones to explore in Kakadu. Do I need a permit to visit Kakadu? Yes, you need a park pass to visit Kakadu. The pass includes free ranger guided walks, talks and cultural activities. You can either book the pass online here, or buy one up at Darwin, Katherine Visitor Centre, Bowali Visitor Centre Jabiru, Two Rivers Newsagency at Jabiru Shopping Plaza, Cooinda Lodge, Aurora Kakadu, Mary River Wilderness Retreat, or Wildman Wilderness Lodge. If you want to go on an overnight bushwalking tour, or camp outside campsites, then you will need a permit. You will also need a photography permit if you take photos of Kakadu for promotional or business purposes. Is it safe to drive at night in or around Kakadu? After dark, it is strongly advised not to drive within the park because of nocturnal animals. Wallabies and dingoes are often seen on the roadside before sunrise. Why can't swim in Twin Falls? As Twin Falls does not dry out in the peak season, it is somewhat difficult to ensure crocodiles are removed from this creek. There is also the fact that Twin Falls is considered a sacred site by the Aborigines so you should respect their land and avoid swimming there.